It’s been a long time since we’ve spent winter in a wintery locale. 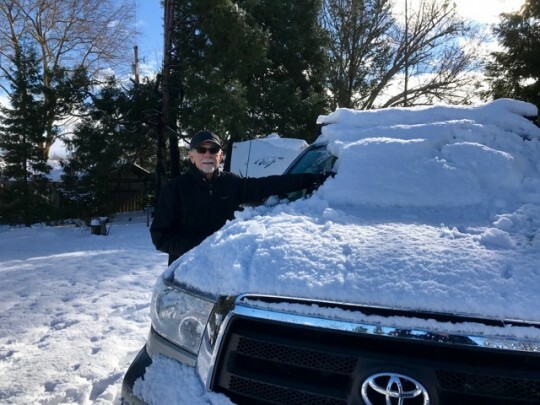 For many years—even before taking to the road full time—we’ve spent a good part of winter in warmer, sunnier climes—southern California, southern Arizona, the Gulf Coast of Texas, Florida. We would never have deliberately planned to spend winter in our trailer in Ashland. 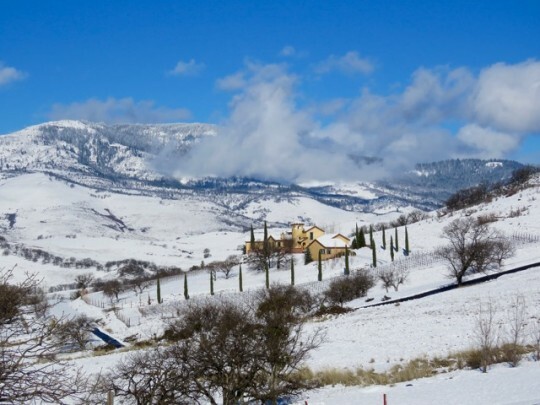 And this has been an unusually cold, wet, and snowy winter for southern Oregon. As I write this, it’s snowing yet again. Our lives have been very different the past several months. Instead of the thrill of almost constant new adventures, we’ve basically been confined to our hometown backyard. But it hasn’t felt like a hardship. Drawing a smaller circle around our lives has been exactly what we needed during this time of healing. Despite the fact that we’d rather be wearing flip-flops instead of snow boots, we’re finding plenty to enjoy. We’re keeping ourselves occupied with daily long walks, time with friends, music gatherings, creative endeavors, and home improvement projects. This winter has turned out to be a rich and satisfying time. 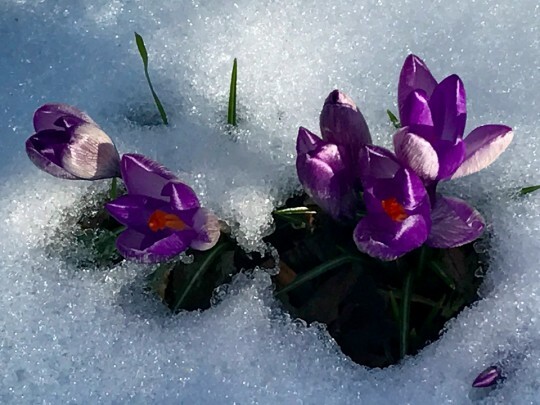 Still, I felt a small thrill of joy when I saw the bright little faces of the crocus poking up through the snow yesterday. Spring really is just around the corner. We had a few flakes ourselves this morning. I’m ready for the “corner” to be just a little closer than it feels. 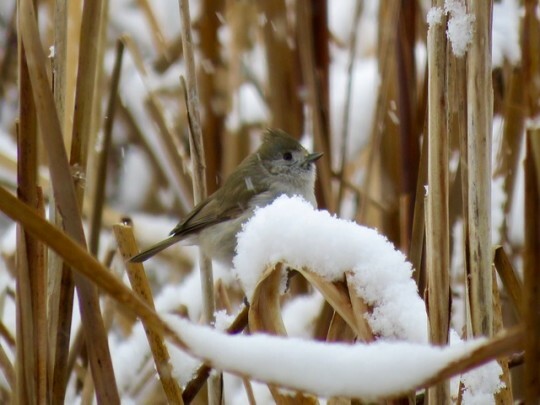 Beautiful photos as usual, and birds I didn’t know existed. 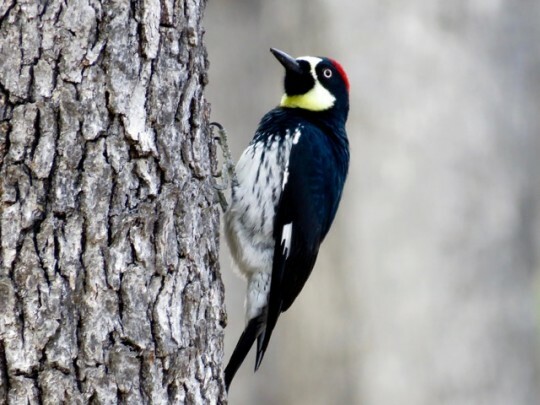 The two woodpeckers are unusual. How much further north do they come? I don’t recall ever seeing them in Eugene. 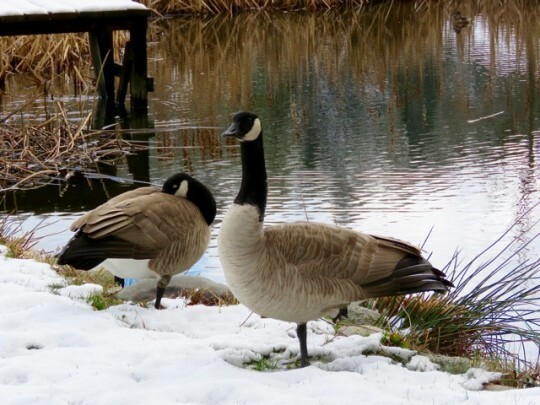 The last photo “Waiting for Spring” was especially poignant. It’s good to see Eric is up and about, and able to do snow removal. Ahhh….for a change I’m not wistfully wishing I was with you as you paddle manatee waters or hike the sandstone canyons or explore the particular flora and fauna of the bayou or a roadside diner with excellent jazz and quirky art….why…because you’re nearby shivering and healing up for your next adventure with new creations to accompany you and remind you, there’s no place like home! Love that we get more play dates and the neighborhood birds are now on the pages with spoonbills! So glad to be a part of the “inner circle.” Kyle and I cherish our musical moments and all others as well. You are both very special indeed! 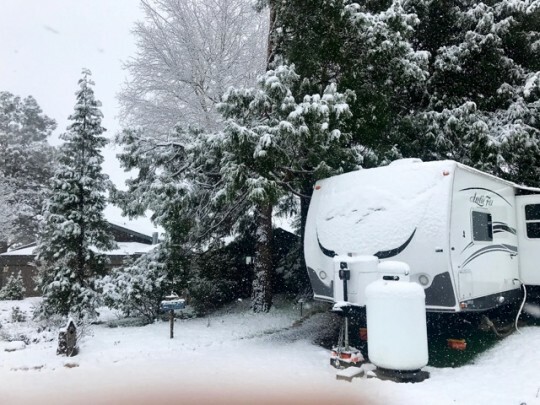 Your positive attitude certainly helped you through this cold, snowy unplanned stay in Oregon:) Good to see Eric out cleaning the snow off the truck. I’m sure he would much preferred sweeping away the dust, though. The snow made for some gorgeous photos. I so enjoyed looking at them from my warmer seat. But I do love seeing the fresh, clean scene after a snow fall with the sun glistening on the crystals. Thanks for sharing:) Love your header with those darling little crocus. Thanks, Pam. I was really happy to see those sweet little crocus—they’re so tenacious and hopeful! Kind of how I feel right now. :-)) The upside of being stuck in such a cold, snowy winter is that we’re having time to pursue projects that aren’t possible when we’re traveling. Oh, yes….more good adventures ahead! Thanks, Sue. Why is it that winter is long, long and spring summer and fall are fast, fast? Leah, I never really thought about it, but you’re absolutely right! We are going to be SO ready for spring when it finally gets here. Jane, it seems to strange to think of it being autumn now for you—which means you have winter heading your way! Then again, you probably have somewhere lovely and warm planned for your winter travels. Okay, then I’m looking forward to seeing winter through your photography! Beautiful pictures. We were glad to have our extended stay in a warm place but the snow can be pretty peaceful. I am surprised how quickly the time has passed but we will be ready to be back on the road again in a week. Debbie, you seemed to enjoy the best of both worlds this winter traveling back and forth between Arizona and Colorado. I’m savoring the peace of winter, because we’ll be back on the road before we know it. So beautifully written and photographed it ALMOST makes me wish I were trapped in the snow. That’s what a good writer and photographer can do. Just lovely. Thank you for your lovely comment, Sherry. Surprisingly, I’m really not minding this mandatory time of staying put. Overall, this has been beneficial for us in many ways. Nonetheless, I am ready for sun and warmth soon! Ah yes, just be glad you aren’t on THIS side of the mountain! As I am glad I am no longer in Rocky Point. Snow is over the top of the car along the roadsides there at our old home. It even snowed at the Cottage in Grants Pass yesterday, and of course, here in Klamath Falls it is a foot deep and blizzarding. March anyone?? Good to hear from you and loved the photos. 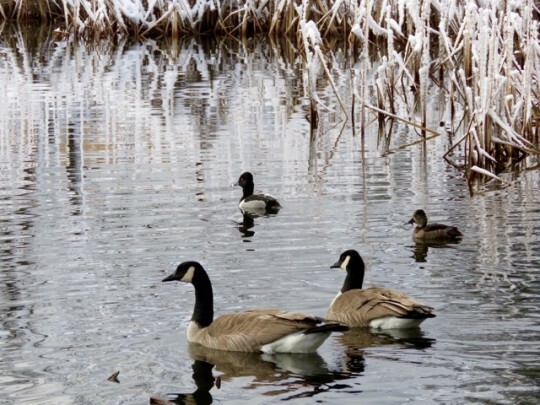 Nice to see you’ve been out with the camera capturing the beauty of winter. Spring is indeed right around the corner! Ingrid, it has been so cold on our walks that I’m mostly snapping photos here and there with my iPhone. Eric is more dedicated, though, and captured the woodpeckers and geese with his camera. Seems this winter we’ve switched places. We’ve been enjoying the desert and warmer weather while you’ve been in serious snow country! We have had our fair share of rain mixed in with our sunny days. It’s been a wet winter! We look forward to ushering in Spring with you before you once again, head into the wild blue yonder! You’ll be on the road again before you know it. See you in a few days. Kath & Ted, you picked a good time to get out of town! We’re looking forward to hearing tales of your travels when you return to the farm…lots of gardening and fun times together in our near future! Safe travels home…love you guys. You have such a positive attitude it is a pleasure to read you! The photos are so beautiful and complimentary to the text. A real case of “the silver lining”. Of course, it takes an eye to see one and appreciate it, which you clearly have and do. Thank you for your lovely comment, Peta. There have been many challenges in this particular life experience, but there also have been many gifts. I do make a practice of looking for the silver lining. It makes me happier. :-)) Wishing you a wonderful spring, as well! There is such beauty to be found in these frosty scenes! I’ve never heard of a Lewis’s woodpecker, what a cutie! 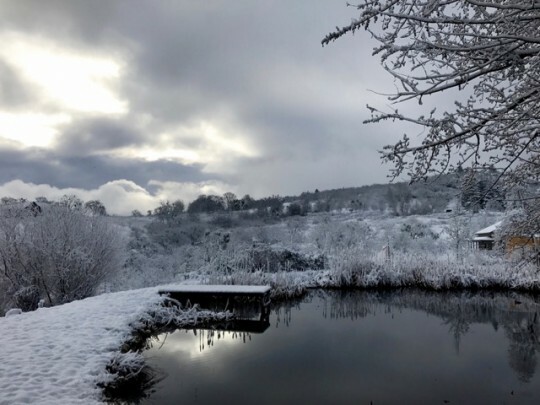 Lovely to see your winter wonderland wrapped up in warm words of appreciation and anticipation. 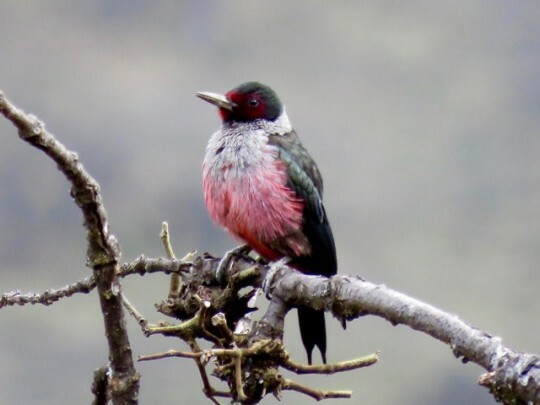 The birds are spectacular – such colors!! 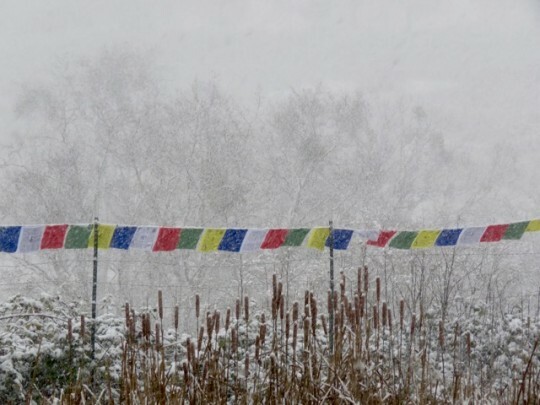 The prayer flags are so pretty in their silent pause. I think you’ll look back on this season as a very special one. Wishing you lots of sunshine and flowers in the weeks to come. Jodee, I so appreciate your positive thoughts. There is much to be grateful for in this quiet time of healing. And we’re really looking forward to spring busting out in the coming weeks! You are really good at making a lemonade for any lemons thrown at yah. And as you said, the healing and the rejuvenation just by staying put is the silver lining. Lovely pictures depicting the emotions of frosty days. Soon you will be out there in flip flops. ML, we seem to have had plenty of opportunities in our travels to learn how to make really good lemonade! :-)) We’re enjoying this peaceful respite in the midst of our adventures, and are also excited about what lies ahead! Your wintry photos are beautiful. Being in Ashland around close friends is just what you two needed during this time of healing and reflecting. Before long you will be raising the jacks on your little Fox. As always, simply beautiful prose to match your mood and reflections. 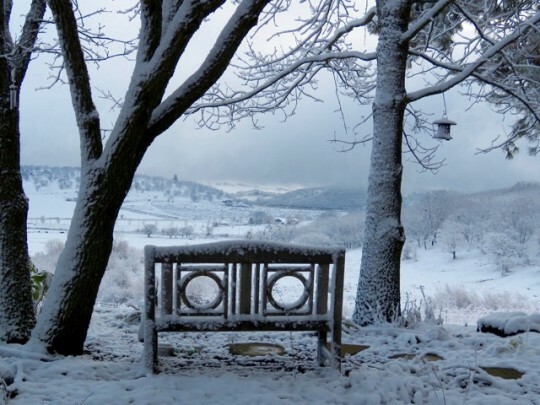 You make the winter in Oregon look inviting…. Thank you, Loretta. Winter here truly is beautiful—but it’s been a really long one this year! We’re ready for spring.